So I started watching Pretty Little Liars recently, and I can't. stop. I'm on episode 17, and I'm dying to know who A is. Oh, also, I'm in love with Mr. Fitz. One thing that I find most ridiculous is the ages of the real-life actors. Spencer, Aria, Emily, and Hanna are all 16. The girls who play them are 25, 21, 24, and 21 respectively. Adorable Mr. Fitz (24) is only three years older than Aria in real life. That means Mr. Fitz is actually younger than Aria's other semi-interest, Noel (25). 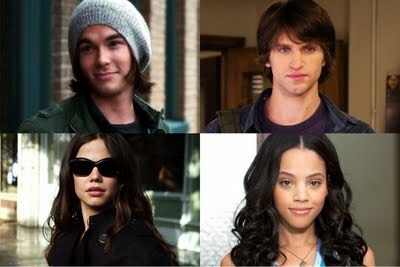 And teenagers Caleb, Toby, Jenna, and Maya? 24, 24, 27, and 32 respectively. I know it's no new trend for young people on TV to be played by older people and older people on TV to be played by younger people, but I feel like this show may be taking the trend to a whole new level of ridiculous. All that said, I'm still obsessed with this show. And I wish Mr. Fitz were real. And I can't wait for it to start up again.